Common throughout all Kittitas County forest zones up to subalpine. In Kitsap, Island, and eastern King Counties, widespread and locally fairly common in relatively undisturbed older conifer forests. 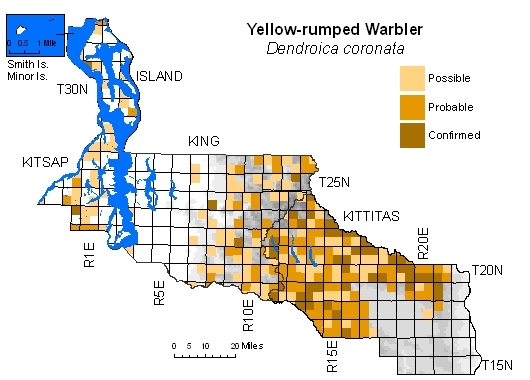 Absent from King County lowlands, with two outlying records probably representing migrants or dispersing failed breeders. Predicted occurrence on Vashon Island by Washington Gap report (Smith et al. 1997) not supported by BBA survey results. 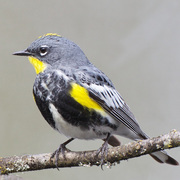 Although D.c. auduboni (Audubon's Warbler) and D.c. coronata (Myrtle Warbler) both common migrants in Washington, only former breeds here.